2. Spread baguette slices across two baking sheets. Drizzle with olive oil. Bake for about 15 minutes, flipping once, until golden-brown. Set aside to cool. 3. In a very hot pan over medium-high heat, add butter. Follow with garlic, and immediately follow with mushrooms. Sprinkle with salt and pepper; let mushrooms sit, searing on pan, for three to five minutes. They should be golden-brown and a bit crispy. Flip, and cook for another three to five minutes. 4. To make the crostini, spread tablespoon of tahini on each baguette slice. 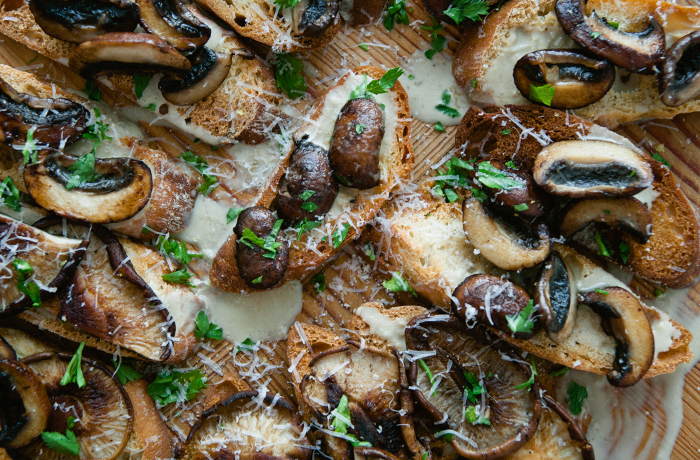 Top with mushrooms, and finish with parsley and olive oil. Enjoy! 2013 Local Flavor Pinot Noir. This Pinot Noir from Santa Rita Hills marks our collaboration with Venice Arts, a nonprofit organization dedicated to improving the lives of low-income youth through the power of film, photography, and multimedia. It’s luscious, weighty, and generally bigger than your typical Pinot Noir — so pair it with bolder foods such as roast pork and Camembert.